Remember Star Trek Online? Yeah, it come out waaaaay back on February 2nd of 2010. Well, it’s Cryptic’s game, but it’s published by Atari, and since there maybe hasn’t been the level of interest everyone was looking for, they are running a sale. It’s a pretty good deal too, since you get the game for $10 off (which isn’t so bad) and you an additional 60 days of free gameplay (which is the frustrating part). That’s a total of 90 days of free play, including the 30 days that come with the purchase of the game. That seems really unfair to the players who pre-ordered or bought the game when it first came out. 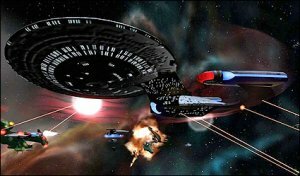 So the Star Trek Online forums are getting ugly, and subscribers are upset. Cryptic and Atari reacted by deleting the threads criticizing them for their actions, and then created a new sticky thread to consolidate all the comments. Needless to say, this decision has made the subscribers even more angry, and Cryptic and Atari have yet to make a decision about how they are going to resolve this issue. Now in the interest of disclosure, I’m currently playing STO. The game is very rough around the edges, and still feels like a beta despite the fact that it was formally released a mere month ago. It’s disturbing to me as a player to see a “fire sale” level promotion so soon, and it makes me fear for the future of the game. Hopefully Cryptic/Atari will realize that they are really burning bridges with the players and make a decision similar to what Blizzard did when World of Warcraft was released with so many problems.